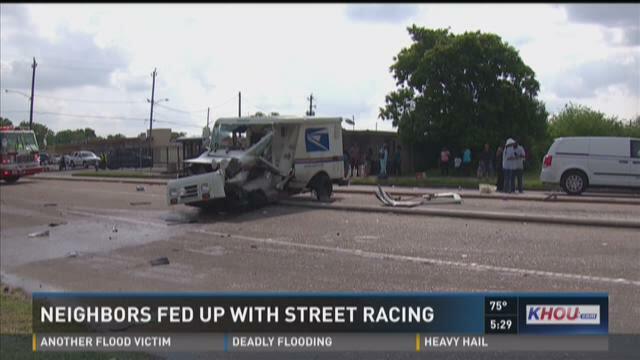 HOUSTON – Residents are fed up with street racing in their neighborhood and are demanding something be done after their beloved, longtime mail carrier was struck by a driver allegedly drag racing. The crash happened Saturday on Scott street in southeast Houston. Cynthia Sanders says two trucks were racing down Scott street near Cullen Middle School when one of them T-boned a U.S. Postal Service truck, sending the neighborhood’s longtime, well-known and well-liked postal carrier to the hospital in critical condition. Police arrested the two men at the scene.